This week, many Jews are eating vegetarian (or pescatarian) as part of the 9 days leading up to Tisha B’Av – the Ninth of Av. Tisha B’Av is a day of mourning and fasting. The holiday commemorates various tragedies that befell the Jewish people throughout history, particularly the destruction of the two temples in 586 BCE and 70 CE. During the 9 days prior to Tisha B’Av, many Jews abstain from red meat, chicken, and wine, instead eating dairy foods and fish. This restriction is in place to acknowledge the tragic destruction of the Second Temple, and to reinforce the solemn nature of the nine days. I’ve been wanting to share this Vegetarian Chopped Liver recipe, and seeing as we’re in the middle of the 9 days, now seems like as good a time as any. There are so many variations on meat-free chopped liver, and many of them are remarkably similar to the real thing. This particular version was shared with me back in 2010, not long after I started this website. Reader Sheri Ellyn Gross sent me the recipe– she calls it “Aunt Bev’s Mock Liver.” Of the recipe, she says: “I make this every year for the holidays. My Mom likes it better than the real thing.” Sheri’s background is Ukranian. Her grandparents came to America in the early 1900’s from Kiev, Russia and settled in Chicago, IL. Her great grandfather was a baker by trade, he opened a bakery in Chicago and became famous for his challah and other breads. My family really enjoys Aunt Bev’s recipe. It is much lighter than traditional chopped liver, and has lots of protein. Although nothing beats the real thing, the flavor of this Vegetarian Chopped Liver might surprise you. 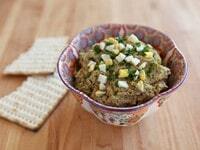 Many thanks to Sheri Ellyn Gross for sharing Aunt Bev’s delicious Vegetarian Chopped Liver recipe with us! Passover Note: This recipe is kosher for Sephardic Passover. Some Ashkenazi Jews do not eat peas during Passover, as it is considered kitniyot. If you’re planning on serving this for the Passover holiday and you’re not super familiar with the kosher rules, check out these Passover kosher guidelines. Learn to make delicious vegetarian chopped liver with sauteed onions, hard boiled eggs, peas, and walnuts. Kosher, pareve. Heat up the oil in a skillet over medium heat till hot enough to fry. 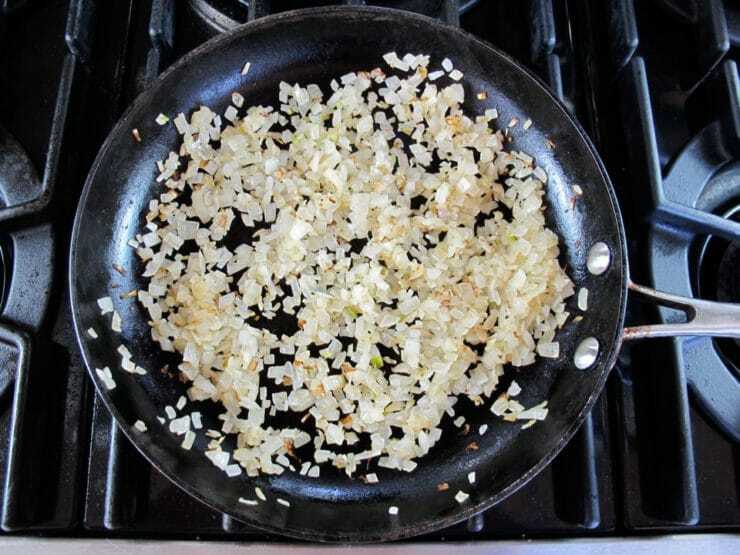 Saute the chopped onion for several minutes till it softens and caramelizes. 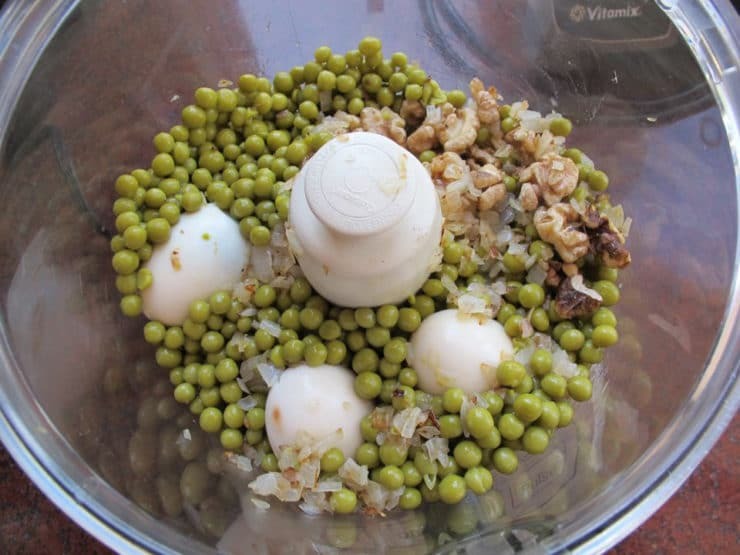 In a food processor, combine sauteed onion, toasted walnuts, 3 hard boiled eggs, and peas. Pulse, then process till the puree resembles chopped liver. Add salt and pepper to taste, and process again to blend. Chop up the remaining egg. Garnish the vegetarian chopped liver with chopped egg and parsley. Serve with crackers for spreading, or matzo during Passover (if you are celebrating Sephardic style-- peas are considered kitniyot). Forgive what may be a silly question from a European. The recipe calls for 1 cup of walnuts. Is this a by volume amount? If it is, is it whole walnuts or crushed – the actual weight would differ. I notice the one cup of onion got converted in metric 160 grammes; so would it be 160 grammes of walnut?. It’s 1 cup of chopped walnuts– that’s an American cup, or 1/2 pint, or 8 ounces, or 236.59 ml. About freezing mock chopped liver (and regular chopped liver too I guess). I just had a brainstorm: I want to double or triple the recipe and freeze some because it’s kind of labor intensive (and addicting!). Hard cooked eggs don’t freeze well though — they get kind of rubbery and watery. SO, I am going to divide the recipe and leave out the eggs until I defrost it. Then I can just give it a whirl in my food processor with freshly cooked eggs. I bet it works! Great plan Janne! Let me know how it goes, would love to recommend it to readers if it works. It has onions twice in the ingredients list, and no measurement for the walnuts. Thank you for the heads up Sri! We recently switched over to a new recipe system and there were some errors during the transition. This one has been corrected. Love your blog. In the vegetarian chopped liver recipe, no quantity or instructions are provided??? Hi Larry! I’m not sure what you mean. I see the recipe on my computer, which includes the amount of servings and full instructions with pictures. Can you describe to me in more detail what you’re seeing on your end, including what device you are using to access the site? Delish! The mushroom recipe may be a bit better to my taste but none on hand so in a pinch this is great! Nutrition info? Hi Marsha! We are working on adding nutrition info for all recipes across the site. Check back soon! I adore this recipe! My dad (now gone 🙁 ) was a famous chef in NYC and he used to make this for me. Your recipe tastes exactly like his. Thank you for sharing it! This chopped “liver” recipe is great. I like it better than the real thing. I plan on making it for Rosh Hashanah. Can you make it in advance and freeze it? Really loved this. Only modification was a Clove of garlic and a tablespoon of ghee. Also was wondering if this would be freezable? Can I use sunflower seeds instead of walnuts? I haven’t tried that before so I’m not sure what the end result will taste like. I have made a very similar recipe for 3 decades without the peas. During Pesach it seems I’m constantly making this because I swear my son inhales it. I made it with brown lentils I’d cooked till soft. Yummy, and the right color! Just made this today and LOVED it! I nearly devoured the whole thing after making it – it almost didnt make the dinner table! The best part- I also used some of it in another recipe that requires pureed liver and that dish also turned out great!!! Thank you so much for this recipe! I changed it a bit and sautéed mushroom with opinion. Great recipe. It’s delish!! I keep coming back this recipe it’s amazing!! I make it year round!! Thanks for sharing it!! This recipe is great. I have been using the same recipe using mushrooms instead of peas. It was a nice surprise to see that you can make it with peas saving me time to chop the mushrooms and then saute them with the onion. Try it with mushrooms. Has anyone tried peanutsin place of walnuts? I tried it with peanuts, and the result was a bit of a peanut flavor that detracted from the chopped liver taste. It wasn’t awful (my family still ate it), but I recommend almonds if you need a substitute. Ahhh, this is a mock “Chopped Liver” I couldn’t for the life of me figure out how you can make “Veggie Chopped Liver” it just didn’t compute, so when I gave the recipe a “Look See” it then made sense. I just learned about a year ago that the only way you can prepare chicken livers is to broil them. I just made this for tomorrow night’s Seder so it would have overnight to “ripen.” Honestly, I was licking the spatula and cannot wait to see how much better it COULD BE tomorrow!! Thank you! And I totally agree that the canned peas are perfect. I make this same recipe and it’s absolutely fabulous. I am vegetarian , but like to make some traditional foods on the holidays! This is one of my regulars. I have been a pescetarian for a long time and I have been craving chopped liver. I wanted a simple recipe and came across this one. The only thing I did different was used crushed (almost to a powder) walnuts left over from last Pesach. (I always have leftover and freeze them adding them to cookies etc to use them up). The recipe was excellent and easy. Unfortunately I needed money and sold my food processor and had to use a blender. It didn’t blend together as well but worked good enough for me. Thank you. My sister-in-law is vegetarian, and she said this will be a regular staple for her now. The meat eaters, and the “traditionalists” all couldn’t get over how much it looked and tasted like “real” chopped liver. The coloring was just right, too. I think that must have been the toasted walnuts. Thank you so much for posting this recipe. It was amazing, delicious, and simple to make! Fabulous David! My family loves it too. Chag Sameach! I toasted the walnuts, and used lentils. I actually parboiled the lentils and then finished them in the fried onions risotto style. Added a lot of delicious flavour. I also seasoned with a bit of balsamic vinegar and a touch or honey. And finally caramelized a whole onion, sliced for the topping. It was delicious! I’ve been eating it on rice crackers! recipes for lentil chopped liver, and I was wondering if this should have lentils in it, but I just missed that part. I think they are two separate types of mock chopped/vegetarian liver. Which one would be the better tasting (more like the real thing)? I guess I’ll have to make both and see. Thanks for the suggestions. 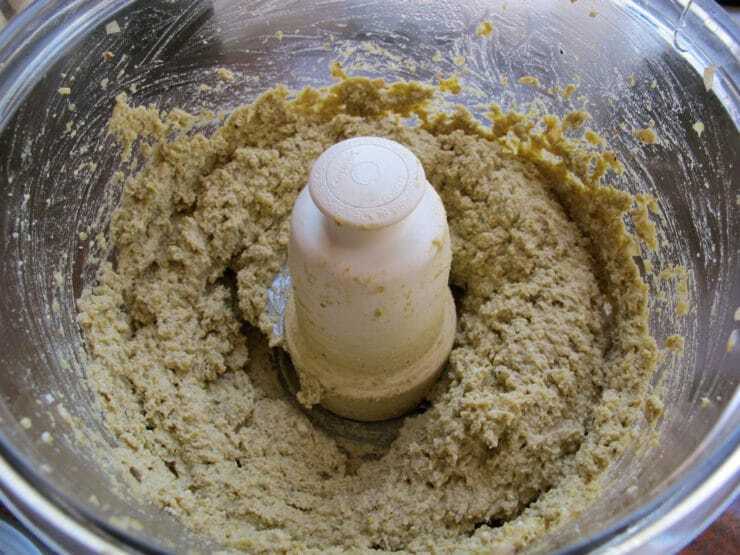 I have been using green/brown lentils for making veggie chopped liver. Very good taste, most people think it tastes like the real thing. I saw there was a comment from back in August of 2012 about leaving out the yolks so I thought I’d give a little bump and see if anyone’s made this with just egg whites. concentrated) day! GREAT Mock Liver recipe, too. Keep up the wonderful work and THANKS!! Terrific recipe, TA! As per my mother, I used to make veggie liver with string beans, but the canned peas seem to add a certain sweetness which to my humble palate, gives it more of a ‘meaty taste,’ while the string beans tasted very flat in comparison. Toasting the walnuts to bring out their flavor is an inordinately good idea as well. While looking at real chopped liver long enough can harden your arteries senseless, this substitute comes very close in texture and even in taste (at least for those first few seconds). Thank you for sharing. Glad you liked it Moshe! Love your website! Thanks! 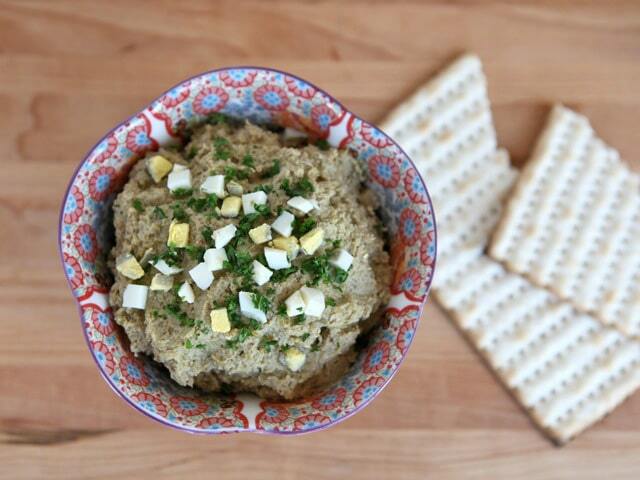 The best veggie chopped liver ever! my neighbor who was a great cook and baker in her younger years insists that cashew nuts give a whole, and better flavor than walnuys, and good for those allergic to walnuts. Just like my mom’s! Love it. I use 3 eggs and a little mayo. I see that you say in the ingredients that the eggs are divided, but I don’t see any instructions for that. I also that that you garnish with chopped egg. And, in the picture, I only see three eggs (not sure if the 4th is covered with the other ingredients). So, in the actually mixture, do you only use 3 eggs? And, the 4th is for garnish? I was putting the recipe into a calorie calculator, so I wanted to check. Blend 3 eggs, use the 4th for garnish. does your husband have a special mayo, that would be an excellent subsitution! My husband can’t have eggs. Any suggestions for substitute or can I just leave out the eggs?? I haven’t tried it myself, but the first substitute that comes to mind is cooked chickpeas. I would definitely substitute something for the eggs, as they add a lot to the texture. I can’t promise it will work, but I’m guessing it will probably be great. If you try it let me know! Sruky what is honey garlic? I am making my veggie chopped liver for Thanksgiving with the sunflower seeds on Wednesday. For me, the color of the chopped liver is brown, and if I would use chickpeas the color would be off. I just checked and I am out of lentils. If we made the chopped liver with lentils……the color would work. I purchased roasted sunflower seeds and OMG, we could not get enough of the chopped liver. This recipe will be made again and again, it is easy and I hope that I did not forget to say delicious. This is a often requested dish that I make for all the holidays. I use defrosted frozen peas and steamed green beans, as well. Love, love, love it! Do you use fresh green beans & steam or frozen/canned? Need a yummy vegetarian liver substitute . @Devra – I use fresh green beans and steam them until tender in the microwave. I use 1 roasted eggplant instead of peas, and 2 – 3 medium onions. This is a staple at my house every Pesach- it’s the best on matza! I make it with green beans instead of peas- I sauté them with the onions. I’ve tried it with no egg yolks, but the texture is not good. I usually leave one or two yolks out with little affect. This is a very good dip. The flavours blend well together and I love the fibre and protein content. Dips are my favourite food and I will be making this again! The canned peas are a real surprise but I bet this tastes great, I’m going to try it minus the egg yolks and see what happens. Any advice for subbing out the egg yolks (cholesterol-free)? Hey Lori Lynn! I know, it’s a very 60’s touch– but the sweetness and softness of the canned peas works perfectly for some reason! I’ve never tried subbing out the egg yolks, I don’t think it would work because a lot of the texture and flavor comes from the hard boiled yolks– though you could omit the garnish on the top to cut one egg out. I’d be curious to see if egg whites work the same, if you try it will you let me know? I don’t eat liver, chopped or otherwise, but this I will eat. I just love dips and spreads made with nuts. Nuts are loaded with protein, fiber, calcium and iron, but I eat them ’cause they taste good. Thank you for the suggestion Cindy! My rabbi is highly allergic to tree nuts, so our shul is nut-free. We as a family, since aware of this have given up peanuts and do eat other nuts. I am thrilled to substitute sunflower seeds in its place since it is healthier and we do eat soy nut and soy butters. I never thought of it! Hope you are doing great, Tori! Looking forward to trying this recipe. Can you use fresh or frozen peas? Thanks in advance! I’ve tried fresh cooked peas Sandi, but for some reason it did not taste the same– it was good, but not quite as good as the canned peas. But if that’s all you have on hand, it will work– just make sure you cook them before adding to the mix, and you’ll need to season the mixture a bit more to taste (canned peas have some salt in them). Enjoy! what if anything can i substitute? I make a similar Version of this using sauteed onions hard boiled eggs green peas and ground walnuts OR almonds. Tastes great! too late for Linda maybe but Morning Star Meatless crumbles work great.